(Poland, native country of Mme. Curie) Polonium, also called Radium F, was the first element discovered by Mme. Curie in 1898 while seeking the cause of radioactivity of pitchblend from Joachimsthal, Bohemia. The electroscope showed it separating with bismuth. 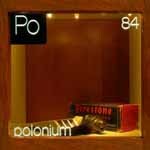 Polonium is a very rare natural element. Uranium ores contain only about 100 micrograms of the element per ton. Its abundance is only about 0.2% of that of radium. In 1934, scientists discovered that when they bombarded natural bismuth (209Bi) with neutrons, 210Bi, the parent of polonium, was obtained. Milligram amounts of polonium may now be prepared this way, by using the high neutron fluxes of nuclear reactors. Polonium is available commercially on special order from the Oak Ridge National Laboratory. Polonium-210 is a low-melting, fairly volatile metal, 50% of which is vaporized in air in 45 hours at 55C. It is an alpha emitter with a half-life of 138.39 days. A milligram emits as many alpha particles as 5 g of radium. The energy released by its decay is so large (140W/g) that a capsule containing about half a gram reaches a temperature above 500C. The capsule also presents a contact gamma-ray dose rate of 0.012 Gy/h. A few curies (1 curie = 3.7 x 1010Bq) of polonium exhibit a blue glow, caused by excitation of the surrounding gas. Polonium is readily dissolved in dilute acids, but is only slightly soluble in alkali. Polonium slats of organic acids char rapidly; halide amines are reduced to the metal. Because almost all alpha radiation is stopped within the solid source and its container, giving up its energy, polonium has attracted attention for uses as a lightweight heat source for thermoelectric power in space satellites. Polonium can be mixed or alloyed with beryllium to provide a source of neutrons. The element has been used in devices for eliminating static charges in textile mills, etc. ; however, beta sources are both more commonly used and less dangerous. It is also used on brushes for removing dust from photographic films. The polonium for these is carefully sealed and controlled, minimizing hazards to the user. Twenty five isotopes of polonium are known, with atomic masses ranging from 194 to 218. Polonium-210 is the most readily available. Isotopes of mass 209 (half-life 103 years) and mass 208 (half-life 2.9 years) can be prepared by alpha, proton, or deuteron bombardment of lead or bismuth in a cyclotron, but these are expensive to produce. Metallic polonium has been prepared from polonium hydroxide and some other polonium compounds in the presence of concentrated aqueous or anhydrous liquid ammonia. Two allotropic modifications are known to exist. Polonium-210 is very dangerous to handle in even milligram or microgram amounts, and special equipment and strict control is necessary. Damage arises from the complete absorption of the energy of the alpha particle into tissue. The maximum permissible body burden for ingested polonium is only 0.03 microcuries, which represents a particle weighing only 6.8 x 10-12 g. Weight for weight it is about 2.5 x 1011 times as toxic as hydrocyanic acid. The maximum allowable concentration for soluble polonium compounds in air is about 2 x 10-11 microcuries/cm3.